The 3D Modeling technology available for our interior designers can really help clients see and “walk-thru” the changes we are recommending. While not used for all projects, it is certainly very helpful for complete renovations and complex projects. Below are a few of our interior design 3D Modeling examples from recent projects we have completed. 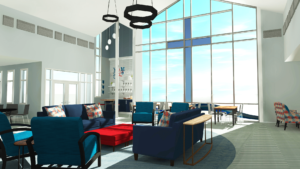 View the lobby and sanctuary virtual tour.